It hasn’t been sunny and warm like San Diego, or breezy like San Francisco, but clubs from those two West Coast sailing meccas shined through some unfamiliar, and dreary, weather on the first two days of the 2018 Resolute Cup, hosted by the New York Yacht Club Harbour Court. 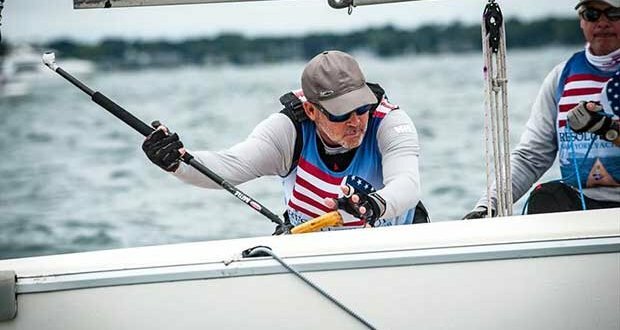 Day 2 started with a healthy does of optimism that the regatta could catch back up after only completing three races on Day 1, but a northeasterly breeze that never quite established itself limited the race committee to two races today on Narragansett Bay. The overall standings will show Eastern Yacht Club (Marblehead, Mass.) in the lead with 15 points, with Chicago Yacht Club in second with 21. But both of those teams have only sailed three of the five races due to the rotation system utilized for the regatta. Among the clubs that have completed four, San Diego Yacht Club (above, boat no. 5) and The San Francisco Yacht Club (Belvedere, Calif., at right) are tied at the sharp end of the standings with Storm Trysail Club (Larchmont, N.Y.). All three teams have 22 points through four races. When factoring in the number of races each team has sailed, there is very little daylight between Eastern in first–averaging 5 points per race–and Coral Reef Yacht Club (Coconut Grove, Fla.) in ninth, with an average of seven points per race. The Resolute Cup was first run in 2010 as the U.S. Qualifying Series for the Rolex New York Yacht Club Invitational Cup. The biennial regatta, which is sailed out of the New York Yacht Club Harbor Court, has since developed an identity of its own as yacht clubs from around the United States send their best amateur sailors to Newport, R.I., to compete for national bragging rights in addition to a potential trip to the Rolex New York Yacht Club Invitational Cup, sailing’s premiere international Corinthian big-boat regatta. The 2018 Resolute Cup will be sailed in the New York Yacht Club’s fleet of 23-foot Sonars. With provided sails, equalized rig tune and a regular boat rotation, it’s a true one-design event. 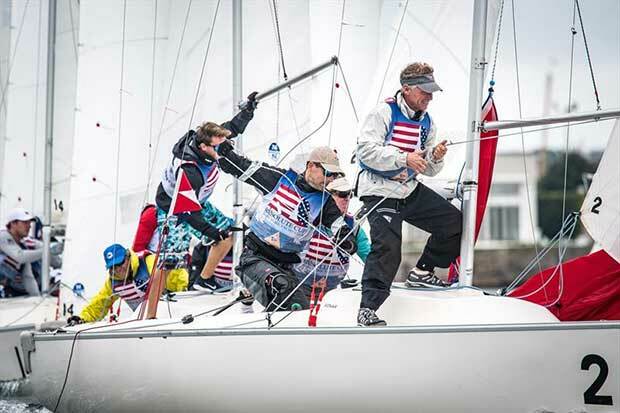 The regatta takes place Sept. 10 to 15 and is sponsored by AIG Private Client Group and Helly Hansen. The final two days of the event will be broadcast live via Facebook. While San Diego has a well-deserved reputation has one of the country’s top sailing yacht clubs–it’s one of three United States yacht clubs to have won the America’s Cup–the club hasn’t shined in its two previous appearances at the Resolute Cup. Sinks, a former college all-star who can count a team racing world championship among his many personal sailing highlights, and his team–the oldest of whom is 30 years old–are well positioned to change that this year. The San Diego team’s youthfulness has served it well so far in the event, but it’s not an essential when it comes to success in this event. The team from Austin Yacht Club has been sailing together longer than any of their competitors from San Diego Yacht Club have been alive. Scott Young, John Morran and Doug Kern started the 2018 Resolute Cup with 14th. After a scheduled race off to ponder what went wrong, they have steadily climbed the ranks with a pair of fifths and a first in today’s second, and final, race. That familiarity, and their collective experience, came in handy after the disappointing start to the regatta. “The first race [of the regatta] was kind of tough,” says Young. “We went into the last few races with the approach that this is more like lake sailing than sailing on open water. We didn’t worry about the tide too much, just tried to play the shifts and stay in pressure and had a decent last three races. The forecast for the final two days is for more sun and a more reliable breeze. With that in mind, competitors tucked into a sumptuous barbecue on the grounds of Harbour Court this evening and turned their focus toward what is sure to be a frenetic final two days of the regatta. A Live Broadcast will start tomorrow at 1000 EDT on Facebook. America’s Cup commentators Tucker Thompson and Andy Green will provide play-by-play and analysis.